Calculating odds is a science, and statisticians/analysts, who can do the job competently, receive good annual salaries (GBP 50k-80k; €60k-95k: Quantitative Analyst). These jobs are paid so well because the results form the backbone of each bookmaker’s business. The better an analyst understands his job, the bigger the potential profit margins for the bookmaker. 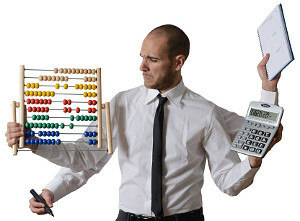 In order to make long-term profits, a good understanding of odds calculation is therefore also essential for any bettor. Odds are based on the probability that a certain event occurs: for example a home win, a draw, or an away win in football games based on historical data. But what is the current probability of each of these outcomes and how are percentages computed? Also, from where does one get the data from? Looking at the graph, one can see that the distribution of results is rather similar for each year. There are quite large differences from the expected values (averages or means) to the observed results (actual results for 2010/2011) in both the drawn matches and away wins categories. However, I am pretty sure that by the end of the season, the figures will adjust themselves more in line with the 5-year average figures and that the differences showing now can be explained by having compared only two-thirds of the current season with the average results of a full-year. However, this indicates that there is an uneven distribution of home wins, draws and away wins at different times over the season, which should balance out by the close. So, if the odds of a single match are calculated, this seasonal effect must be considered, but for this article and for your general understanding, I shall not complicate matters by touching on it further. The arithmetic mean, often referred to as simply the mean or average when the context is clear, is a method to derive the central tendency of a sample. In probability theory, the mean is also called expected value (or expectation, or mathematical expectation, or the first moment). The mean (average value) is a known value and can therefore be used as an expectancy value. Simply speaking, one can use the mean to predict future events (e.g. the distribution of football results) quite accurately. 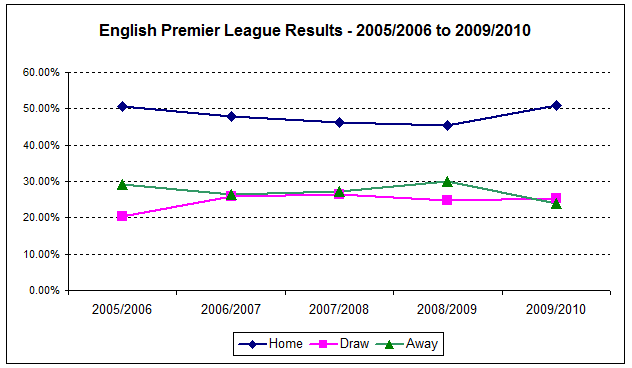 Therefore, it “is expected” that the 2010/2011 season will produce 48.16% home wins. Statistical errors and residuals are two closely related and easily confused measures of the deviation. The error of a sample (e.g. observed football results for a certain period of time) is the ‘relative’ deviation from the function value (mean), while the residual is the difference (absolute deviation) between the sample and the function value (mean). The error (relative deviation) is the proportional deviation between the observed value (the actual results) and the expectancy value (the mean/ average of all years). The error (relative deviation) puts residuals into relation to each other.